Iggy Pop and the Stooges are a primary source, no matter how you look at it. If you look at punk rock and modern rock in general, you can hear and even taste some of the Stooges. They were true originators. Every person who makes or hears music needs to learn about the Stooges at some point. You don’t have to own their albums, you don’t have to memorize songs, you just have to hear them once. Doing so will put things in context and will help you understand what you’re listening to in this day and age. Now I’m going to say something controversial: Raw Power is overrated. Not because of the songs, but because of the recording style. Yeah, I think Search and Destroy is a cool song, but the rest of the stuff on the album? I’m not so sure. It might be that with enough patience I’ll be able to appreciate the rest of the offerings on Raw Power but for that to happen it needs to be remixed or even rerecorded. The drums are super quiet and the lead guitar super loud. So, you’ve fucked the rhythm because you can barely hear the drums, and every lead is distracting instead of fitting in with the song. Is this any way to listen to an album? The story goes that David Bowie only had a couple days to mix the album, but if he knew what he was doing, he would have done fine with the final 8 songs. Sorry, but that’s a fact. So, the parts of Raw Power that DO shine, do so in spite of the mixing. That’s what makes Rare Power so surprising. The songs in this collection might actually be better than the Raw Power album itself. These tracks sound less dressed up and more (pardon the pun) raw. It just fits the band better. It should also be noted that Bowie’s name is nowhere in the credits, so I don’t know what version of the Stooges we’re getting here, but it sounds better than anything Bowie molded. And these aren’t throwaway songs either: I’m Hungry and I’m Sick of You hold their own much better than any of the modern Stooges stuff. 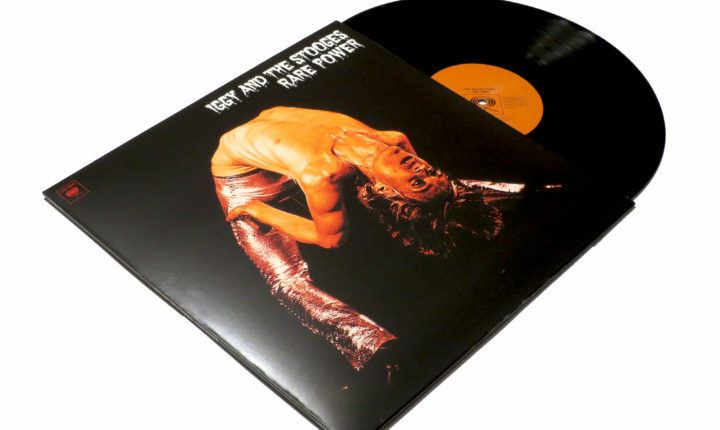 Rare Power doesn’t just collect the rarer tracks in the Stooges’ catalog but also alternative remixes, including some by Iggy Pop himself, and some reimagined versions of known songs like Josh Mobley remix of Gimme Danger. I think this collection (available for the first time on vinyl) will help me appreciate this era of the Stooges and capture some of the magic lost in the final mix of Raw Power. I imagine that these songs have been mixed and remixed at least a dozen times since they were recorded and some definitive versions probably exist. I wouldn’t be surprised if some of them are right here on this collection.